Laugh Factory Chicago and One Warm Coat are teaming up to help provide hundreds of students with warm coats the winter. One Warm Coat is a national non-profit organization that hustles to make sure anyone in need is given winter gear. 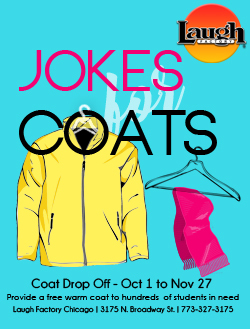 Laugh Factory Chicago is opening their doors to have a drop off location for the next two months. If you have any spare coats lying around don't throw them out. As a perk, receive complimentary VIP tickets for your generous donation. For times to drop off or more information please contact Curtis Shaw Flagg at Curtis@laughfactory.com or call the office at 773-327-3175.